Roadside buildings scream so loud for our attention, we really owe it to them to stop and buy a burger, or take a nap, or wash the car. The shrieking orange cheesehole girders at Beverly and Virgil certainly owned this intersection in 1962. 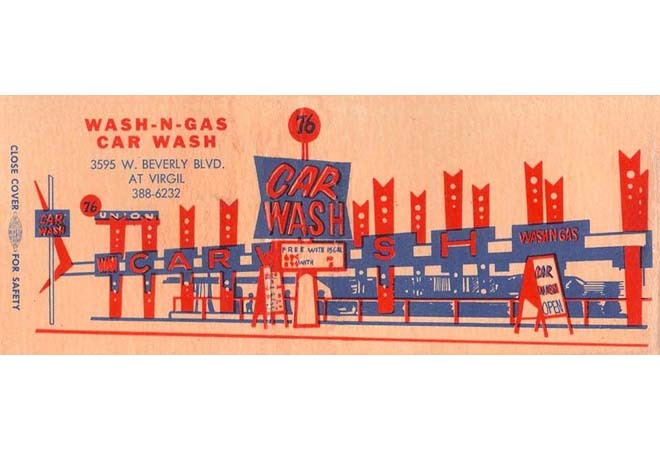 A few years later, the Wash-N-Gas entombed their eye-catching I-Beams in tasteful Palos Verdes Stone. When they threw out the “N Gas” part of their sign, I took them home. The since-renamed Silver Lake Car Wash will still scrub and buff your ride, and if you roll in on Wednesday or Thursday it’s only $7.99. Previous articleYCETS: Extra, Extra! Hear All About It!